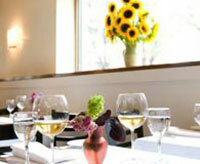 Avenue One serves contemporary New England cuisine in a relaxed atmosphere. 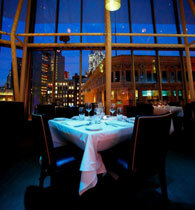 Conveniently situated in the heart of downtown, just steps from many theatres, hip bars and South Station. 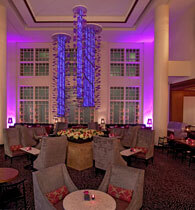 Avenue One is a great location for a hearty breakfast, power lunch, after work drinks and pre-theatre meals. See our website for more details. Fleming�s Prime Steakhouse & Wine Bar is the ultimate steakhouse destination for people seeking a stylish, lively and contemporary dining experience. Nationally renowned for our USDA Prime beef and steakhouse fare, Fleming's is equally celebrated for the "Fleming's 100", our award-winning wine list that features 100 wines by-the-glass, many available at $10 or less. While Prime beef reigns supreme, other flavorful dishes offered include chops, freshly grilled fish and poultry, generous salads and side orders. Whether you're enjoying a casual bite and glass of wine in our bar or an evening of indulgent dining, our goal at Fleming's is to provide an ongoing celebration of exceptional food and wine, to be enjoyed in the company of friends and family. We look forward to the pleasure of your company. 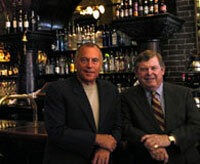 Charles Draghi and Joan Johnson's highly acclaimed contemporary Italian restaurant and wine bar. With Charles' simple, ever changing menus, rooted in traditional regional Italian cooking,and the best seasonal local ingredients. 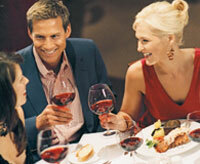 This restaurant has won numerous awards and kudos from critics, and many dedicated customers. Along side the Italian menus are equally lauded, all Italian wine lists, comprised of rare and traditional village wines. Joan has created the inviting ambiance of erbaluce, which is lovely, simply elegant, and romantic- recalling the classic trattorias of Northern Italy. The enoteca/wine bar is a cozy and lively meeting place, with its own menu of simple plates and a fun cordials cocktail list. Joan's welcoming presence in the dining room, along with Charles' inventive cuisine and rare wine offerings, make an evening at erbaluce a truly wonderful and unique dining experience. Conveniently located in the Boston Park Plaza Hotel adjacent to the Theater District, the Back Bay, Beacon Hill, Bay Village and the South End, McCormick & Schmick's Seafood Restaurant maintains a stellar reputation for uncompromising value and quality. Whether meeting for lunch, dinner, drinks or after theater dining, McCormick & Schmick's is the ultimate choice for family, friends, visitors and business associates. 28 Degrees is a blend of extraordinary food, superb cocktails, soul stirring music and innovative design in the ultimate lounge setting. 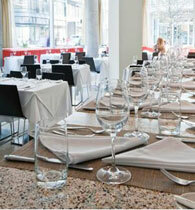 The menu is meant to compliment the social setting of the space. 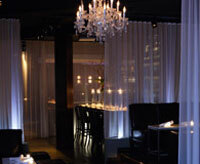 Located in the North Tower of The Ritz Carlton Residences in Boston's Downtown Crossing neighborhood, BiNA osteria serves refined contemporary Italian cuisine in a one of a kind, spectacular setting. The menu is inspired and focused on using the best of local and sustainable food sources. The design of the space, by architects office dA, is adorned with sprawling umbrella like ceilings over an authentic Italian terrazzo floor. From our cuisine, design, wine list and hospitality, BiNA osteria strives to transcend your senses. blu Restaurant and Bar allows you to take in sky-high views while dining on seasonal menus from Executive Chef Kathleen Smith. Feast on Chef Smith's creations for either lunch or dinner while enjoying the view from blu's bar area or dining room. Located on the 4th Floor at The Sports Club/LA, blu is a perfect venue for a pre-theater dinner, special occasions, or hosting an event.